first driver / car to break 300 mph barrier. On this day, 79 years ago, in 1935 on the Bonneville Salt Flats in Utah, SIR MALCOLM CAMPBELL became the first driver to drive break the 300 miles per hour barrier. Driving his iconic BLUEBIRD - a 28 foot long, 2,500 horsepower behemoth weighing in at over 12,000-pound - Campbell pushed the new world land speed record to 301.203 mph. The scene before the start of the record attempt has been beautifully captured by equally iconic artist JACK VETTRIANO in his evocative oil on canvas painting "Bluebird at Bonneville" - painted in 1995. This and six other paintings were commissioned - for his Bluebird Club in London - by owner Sir Terence Conran. 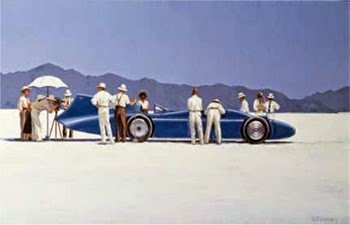 In 2007, the original "Bluebird at Bonneville" painting was sold at auction for more than six hundred thousand pounds. For a lot less you can own your own official print version to hang on your wall. Sir Malcolm Campbell's 1935 Land Speed record attempt.